In luxury’s own lap at Taj Exotica Resort & Spa, Goa , embrace the languid and laid-back life that is so characteristic of this sunny beach state. Located in Benaulim on the southwest coast of Goa and overlooking the Arabian Sea, this Mediterranean-inspired resort will slow down your time to a tranquil tempo. Forty minutes away from the airport, the resort sprawls over 56 acres of lush greenery, and is divided into the main hotel building with large deluxe and luxury rooms, and villa rooms. All this space coupled with old-world architecture, flower-lined patios and a sunshine-laden atrium make for a perfect romantic or family holiday. Enjoy a meal at the restaurant, or stay in and take advantage of the resort's room service (during limited hours). Quench your thirst with your favorite drink at the bar/lounge. English breakfasts are available daily from 8 AM to 11 AM for a fee. Make yourself at home in one of the 48 air-conditioned guestrooms. Complimentary wireless Internet access keeps you connected, and cable programming is available for your entertainment. Private bathrooms with showers feature complimentary toiletries and hair dryers. Conveniences include phones, as well as safes and desks. When you stay at Joecons Beach Resort in Benaulim, you'll be by the sea, within a 10-minute drive of Varca Beach and Benaulim Beach. 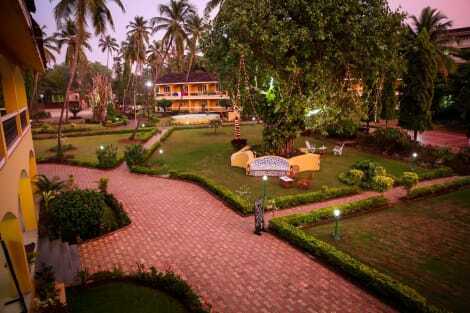 This family-friendly resort is 2.9 mi (4.6 km) from Colva Beach and 4.8 mi (7.8 km) from Cavelossim Beach. Stay in one of 26 guestrooms featuring LCD televisions. Your memory foam bed comes with premium bedding. Rooms have private balconies. Complimentary wireless Internet access keeps you connected, and cable programming is available for your entertainment. Private bathrooms with showers feature rainfall showerheads and complimentary toiletries. lastminute.com has a fantastic range of hotels in Benaulim, with everything from cheap hotels to luxurious five star accommodation available. We like to live up to our last minute name so remember you can book any one of our excellent Benaulim hotels up until midnight and stay the same night.